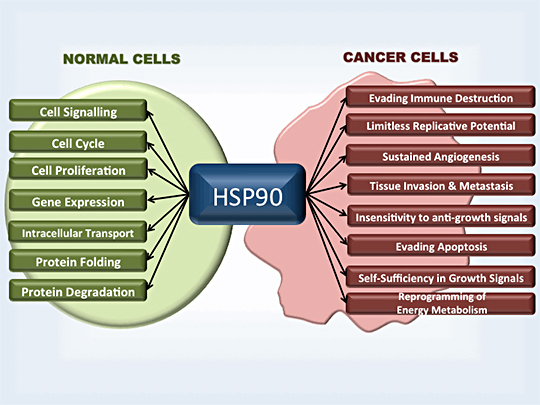 Heat Shock Protein-90 (Hsp90) is a molecular chaperone critical to the folding, stability and activity of many proteins known as "client proteins" including many responsible for tumor initiation, progression and metastasis. This makes the chaperone Hsp90 an attractive target for cancer therapy. Hsp90 chaperone function is coupled to its ATPase activity. Small molecule inhibitors of Hsp90 bind to the ATP-binding pocket on Hsp90, which prevents its interaction with the client proteins therefore, leading to their degradation by the proteasome. In contrast to other anti-cancer drugs, Hsp90 inhibitors simultaneously inhibit multiple drivers of oncogenesis. Examples include Raf-1, HER2/ErBb2, VGEF receptor, DNA repair proteins, HIF1α and other regulators of the tumor growth, angiogenesis, metastasis and survival. Inhibition of Hsp90 therefore leads to simultaneous inhibition of a broad range of oncogenic pathways. Our work on post-translational modifications of Hsp90 has redefined the regulation of its chaperone activity and revealed the reciprocal regulatory mechanisms between the "kinase clients" and Hsp90. Our research currently focuses on dissecting this process in kidney cancer. Worldwide nearly 338,000 people develop kidney cancer every year, and over 100,000 people die from the disease. Renal cell carcinoma (RCC) is the most common type of chemotherapy-resistant kidney cancer and it is distinguishable by histopathological features as well as the underlying gene mutations. The most common type of RCC, clear cell renal cell carcinoma (ccRCC), is closely associated with the mutations of the Von Hippel-Lindau (VHL) tumor suppressor gene that lead to stabilization of hypoxia inducible factors (HIF-1α and HIF-2α), which is critical for tumor growth and angiogenesis in both sporadic and familial forms of this disease. VHL also possess multiple HIF-independent functions. Our laboratory uses a combination of cell-based assays, biochemical, biophysical assays, tumors derived from ccRCC patients and tumor xenografts to investigate the role of post-translational modifications of Hsp90 and its co-chaperones in chaperoning the signaling pathways that maybe involved in ccRCC initiation and progression. Tumor suppressor Tsc1 is a new Hsp90 co-chaperone that facilitates folding of kinase and non-kinase clients. Woodford MR, Sager RA, Marris E, Dunn DM, Blanden AR, Murphy RL, Rensing N, Shapiro O, Panaretou B, Prodromou C, Loh SN, Gutmann DH, Bourboulia D, Bratslavsky G, Wong M, Mollapour M. EMBO J. 2017. Phosphorylation and Ubiquitination Regulate Protein Phosphatase 5 Activity and Its Prosurvival Role in Kidney Cancer. Dushukyan N, Dunn DM, Sager RA, Woodford MR, Loiselle DR, Daneshvar M, Baker-Williams AJ, Chisholm JD, Truman AW, Vaughan CK, Haystead TA, Bratslavsky G, Bourboulia D, Mollapour M. Cell Rep. 2017; 21: 1883-1895. The FNIP co-chaperones decelerate the Hsp90 chaperone cycle and enhance drug binding. Woodford MR, Dunn DM, Blanden AR, Capriotti D, Loiselle D, Prodromou C, Panaretou B, Hughes PF, Smith A, Ackerman W, Haystead TA, Loh SN, Bourboulia D, Schmidt LS, Marston Linehan W, Bratslavsky G, Mollapour M. Nat Commun. 2016; 29;7:12037-12052. Impact of Posttranslational Modifications on the Anticancer Activity of Hsp90 Inhibitors. Woodford MR, Dunn D, Miller JB, Jamal S, Neckers L, Mollapour M. Adv Cancer Res. 2016;129:31-50. Sixth BHD symposium and first international upstate kidney cancer symposium: latest scientific and clinical discoveries. 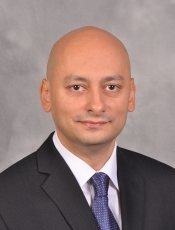 Bratslavsky G, Woodford MR, Daneshvar M, Mollapour M. Oncotarget. 2016 Feb 25.
c-Abl Mediated Tyrosine Phosphorylation of Aha1 Activates Its Co-chaperone Function in Cancer Cells. Dunn DM, Woodford MR, Truman AW, Jensen SM, Schulman J, Caza T, Remillard TC, Loiselle D, Wolfgeher D, Blagg BS, Franco L, Haystead TA, Daturpalli S, Mayer MP, Trepel JB, Morgan RM, Prodromou C, Kron SJ, Panaretou B, Stetler-Stevenson WG, Landas SK, Neckers L, Bratslavsky G, Bourboulia D, Mollapour M. Cell Rep. 2015 Aug 11;12(6):1006-18.